Storm Commandos, also known as Imperial commandos or shadow scouts, were the special forces of the Galactic Empire's Stormtrooper Corps and trained to deal with extreme combat situations. 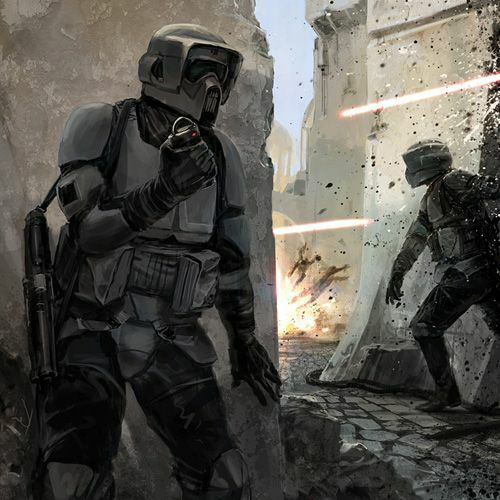 They were equipped with storm commando armor and carried E-11 blaster rifles. 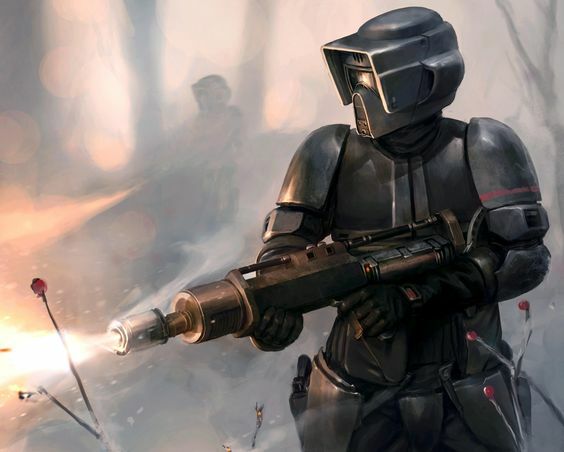 Some Storm Commandos were members of the elite 501st Legion, Darth Vader's personal stormtrooper battalion. One task for storm commandos was to instigate uprisings on enemy systems or to subdue insurrections on Imperial-held worlds. They also served as second-wave attackers in the battlefield, tasked with holding territory won by the first wave. Like scout trooper armor, Storm Commando armor was blast reinforced to provide protection against physical and energy attacks without being restrictive to wear. It also shared the climate-controlled sealed body glove and breath mask which allowed the wearer to operate in toxic and otherwise hostile environments. It's most notable feature, however, was its special polymer coating known as reflec which bent light and sensor energy away from it. This made the wearer practically invisible to most sensor scans, although a determined attempt could detect them. The armor also had a layer of sound baffling built into it, enabling the Storm Commando to move more quietly (armor check penalty does not apply to Stealth checks). The radius of the sound dampener was able to reach up to a meter. The armor's helmet contained standard features like a tongue-activated comlink and Multi-Frequency Targeting and Acquisition System. In addition, the helmet's viewplate doubled as a macrobinocular with a range of one kilometer and ultraviolet nightvision capability. The armor included a utility belt to carry the equipment necessary for the Storm Commando's mission. Standard gear included a high-tension wire, grappling hooks, spare blaster power packs, ion flares, food rations and water packs, a spare comlink, and two medi-packs, with additional pouches for carrying other supplies. Since Storm Commandos preferred to operate in darkness, their armor was normally painted black with no distinguishing markings such as unit insignias.